For as long as I can remember fire has played a huge role in bringing my family together. Growing up I spent every weekend, and all the school holidays, on the North Wales coast in a little village called Abersoch. We spent our days fishing out at sea, sailing, swimming, wakeboarding, waterskiing and being towed around in an inflatable donut. At the end of the day the kids and the parents would regroup at the beach hut around a big fire. We'd bbq our days catch (usually mackerel) and us kids would be sent up to the butchers for some of their infamous jalopeno burgers and sausages. When my aunt and uncle used to come down for the weekends, my cousins and I would spend our evenings riding bikes around the caravan site scouting new locations to build dens and stealing damsons from the farmers bushes. We'd come back to the caravan to find our parents absolutely sozzled around the fire pit and not making much sense. We'd sit around the fire with them and be allowed to stay up late. When we'd eventually be sent to bed, clothes saturated with the smell of wood smoke, I'd lay there listening to my families laughter outside and as I closed my eyes I'd feel the motion of the sea (a consequence of spending the whole day on a boat). As a young adult, I'd come back from London to spend the occasional weekend at my parents. Again we'd spend the day times at the beach or out at sea and we'd spend the evenings catching up around the fire pit drinking red wine. It's around the fire where my mum would enquire about any romantic interests that I had at that time and my dad would push me on the overall vision for my life. Fire has a habit of bringing people together, slowing things down and encouraging a different kind of conversation. One of the things I was most excited about when I moved down to Cornwall from London was being able to have fires again but cooking over a wood fire is something that is fairly new to me. As a child, every evening worth remembering was spent around a fire but the food was largely prepared on a gas bbq. It wasn't until I moved down here that I began experimenting with combining my love for food with my love for fire. At the moment, I am eager to try out ANY new fire cooking technique that I hear about and am constantly scouring cookery books, the internet and contacting the friends I've made from travelling to learn about the fire cooking traditions of South America, the Middle East, Scandinavia and India etc. This Sunday was a beautiful day so Leigh and I decided to pause the renovations on the house and head down to the south coast. Our kitchen oven packed in last week and we're big fans of a traditional Sunday roast dinner so it was the perfect time to try out some new cooking methods I'd been learning about. We packed the van and headed to Praa sands. 'Rescoldo' - Cooking vegetables in the hot ashes of a fire has been a technique used for thousands of years. 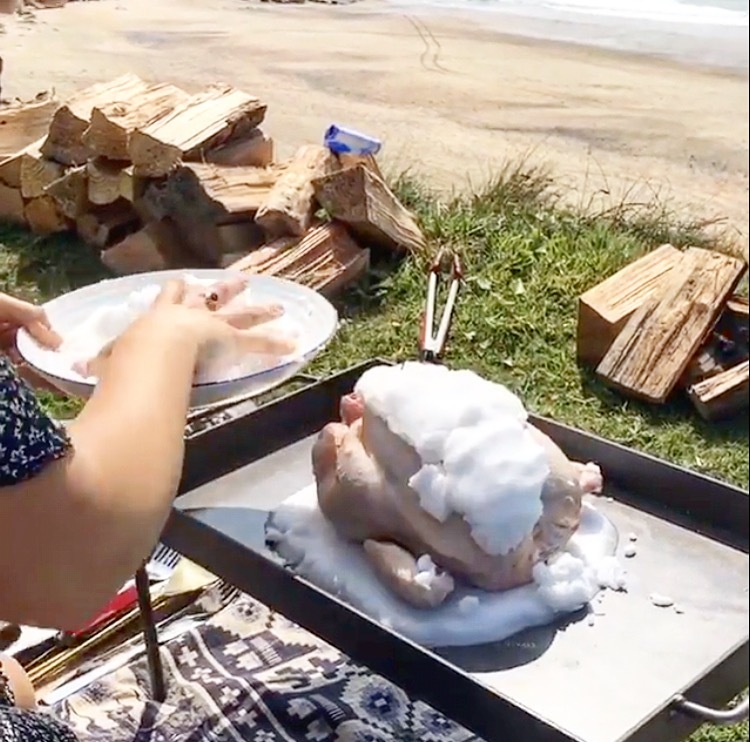 Archeologists have found ashes that point to this cooking method in South America and Israel that date back to 1Million to 1.5Million years ago. 'Infernillo' - Translates to 'little hell' and is cooking between two fires creating an oven with heat from all angles. In order to create the Little Hell "Infernillo" I purchased two chapas (Cast iron grills) from www.argentiniancross.com . I lit a fire beneath one of the Chapas and put the chicken on top and then put another chapa on top of that and lit another larger fire on it. The fire on the bottom was fairly small. Heat rises so it doesn't require too big of a fire to cook the chicken from the bottom. In order to do the chicken I got a few bags of table salt and wet it in a bowl until it was the same kind of consistency as the wet sand you would use to make sand castles. On the chapa I made a base out of the wet salt that was about 1cm thick. The circumference was enough to seat the chicken on with about a 1inch rim around the outside. I then placed the chicken on top and began to cover the chicken in the wet salt. I didn't season the chicken on this occasion but next time I will be putting some butter mixed with herbs and garlic under the chicken skin before covering it with salt. I slowly packed the salt handfuls onto the chicken making sure I covered any cracks that appeared. When the chicken was completely covered I then placed the second chapa on top and built a fire on there. This fire was bigger than the fire on the bottom as it requires a bigger fire to push the heat down and cook the top of the chicken. Once this was done Leigh got in his wetsuit and went for a surf and I poured some red wine and sat back with the latest issue of The Simple Things Magazine. 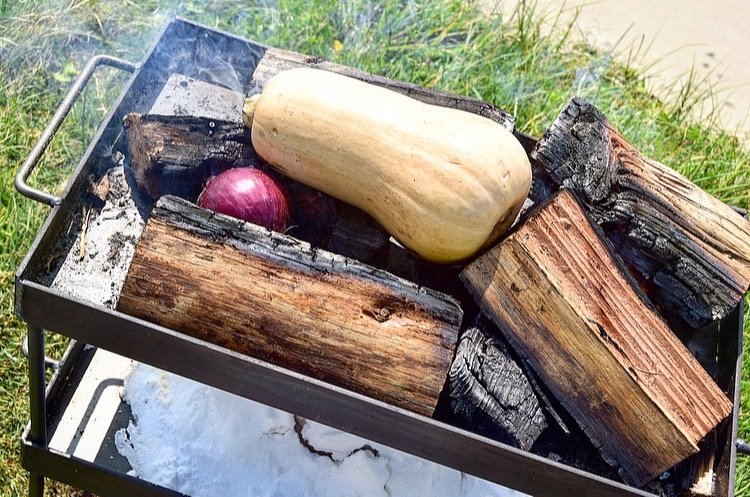 About thirty mins into the cooking time I put a whole butter nut squash (Skin on) into the fires embers along with a couple of red onions (Again skin on). This photo shows them on the top fire but I later moved them to the bottom fire as they seemed to cook better there. 2 hours into the overall cooking time (chicken had been on for two hours and the veg has been in for 1.5 hours) I used a paella cooking pan to make some Papas Arrugadas. Papas Arrugadas originates from the Canary Islands and are these wonderfully salty wrinkly potatoes. I placed the new potatoes in the pan and filled it with some water. I then added a good few generous pinches of salt, probably about 3 table spoons in total. I let the water boil down until dry and then added some more water and began the boiling down process again. The second time the water had boiled down the potatoes were perfectly soft through and were left wrinkly and covered in a layer of fine salt. I pulled the potatoes off the fire and left them in the pan and placed a tub of garlic mayo in the centre. I pulled the butter nut squash out of the fire and cut it down the middle. The black outside with the soft bright orange flesh is a beautiful sight and the smokey ash compliments the sweet flesh in an almost magical way. I left the ash on, scooped out the seeds, cut it into chunks and lined the base of a bowl with it. I pulled the onions off the fire and took off the burnt skin to reveal the most gloriously sweet smelling soft red onions in the centre. I roughly chopped them and threw them on top of the butter nut squash. I then sliced some avocado and added that to the salad bowl, threw in some mozzarella cheese and pomegranate seeds and then drizzled it with some good quality olive oil some salt and black pepper. Thats the sides done. Now for the main event. I cracked open the hard salt casing of the chicken and cut into it not really knowing what state it was going to be in. I had taken a meat thermometer with me to stick into the side of the chicken. A safe internal temperature for chicken is 165 degrees fahrenheit and after 2.5hours of cooking I put the thermometer in to reveal it was 170 degrees but, blinded by the salt casing, I didn't really know where I was sticking it or how deep so it was a little bit of guess work. As I cut into the chicken clear juice ran out, and then more juice, and more. The chicken was perfectly cooked and the most juicy chicken I have ever eaten. The salt baked chicken, the fire cooked veg salad and the papas arrugadas made for an excellent twist to a conventional sunday roast and everything tasted insanely good. Seriously, seriously, seriously, insanely good. 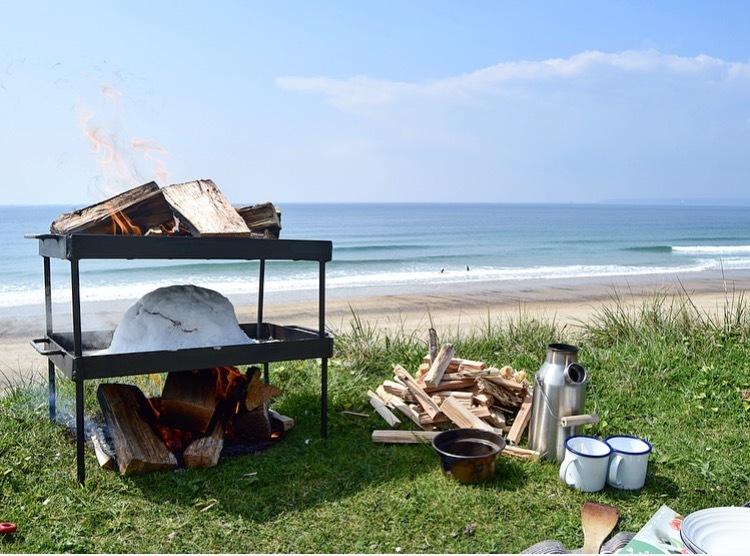 So in summary salt baking is something that I am definatly going to do more of and it was a really fun and relaxed way to enjoy one of our favourite beaches on the south coast. We finished the day with a cup of tea made in our kelly kettle (if you follow me on instagram you'll already know how much I rave about this new piece of kit) and a walk along the beach. And yes we use pieces of kindling as spoons when we fire cook. We went over very sun burnt but with full tummies and happy hearts. So now I'm keen to know whether i've convinced you enough to give fire cooking a go yourself? Let me know what you think in the comments below. We've sent you an email confirmation. If it doesn't come through be sure to check your junk mail.